After spending time, money, and tremendous effort building your website, you would think your worrying is over. But, there is still the issue of ongoing support and maintenance for your web server. Neglecting the ongoing maintenance and updates required, as well as improper monitoring for potential issues can result in eventual catastrophic downtime or worse: intrusions. Who needs server monitoring and maintenance? Typically, it’s customers who have a dedicated server or virtual server powering their website. Dedicated solutions offer increased levels of control and flexibility over your website and its configuration versus shared web hosting solutions. Without getting into too much detail on Web hosting and how it works—consider the following analogy: A shared Web hosting solution is similar to an apartment building. Your website will live inside a unit, which will be on a server with many other units. If your neighbor had a party with a ton of people, the elevators would clog and your access would be limited. The same exists for web hosting in a shared environment. Dedicated environments are the equivalent of a single family home: you can manage, configure, and utilize the server as you see fit. However, that also means you take on the responsibility of maintenance and updates. Most of the tier one providers, such as Rackspace, do offer the ability to have your server managed, but many do not. It is in those scenarios where help from a third party is essential. At NPG, we focus on two areas in terms of web server management: the actual day-to-day management and upgrades, and full-time uptime monitoring. Managing a web server is something that is absolutely critical. A web server typically contains many different software packages. This means it has the core operating system such as Linux or Windows, and then additional software such as PHP, Apache, MySQL, MongoDB, OpenSSL, and etc. A simple web server could have hundreds of software packages that require policing and updates. Each package requires upkeep to ensure it’s up-to-date, safe, and secure. As such, it is essential that a qualified team monitors and manages these updates and upgrades to ensure compliance with the latest security requirements. Server Monitoring is an insurance policy that all website owners should consider. Monitoring can be simple or complex, depending on what your needs are. On the simple end of the spectrum, a website should be monitored for absolute downtime at a bare minimum. This means if the website is down from two or more locations the website owners are notified so they can diagnose and prescribe actions to fix the issue. The more comprehensive and complex solution is to monitor potential issues before they arise. Issues that cause downtime typically come from two sources: the server itself, or the network that leads to the server. In a majority of cases, downtime can be predicted by monitoring the right metrics before a catastrophic failure occurs. This provides the ultimate insurance policy to help keep your website running effectively, 24 hours a day. Our internal monitoring service, checks websites on a minute by minute basis across a variety of metrics—ranging from server memory, CPU load, hard drive space through to network stability, and throughput—oftentimes warning us of potential issues long before they occur. Downtime is always the absolute last thing you want to deal with—it’s a worst case scenario that can be avoided with proper planning. 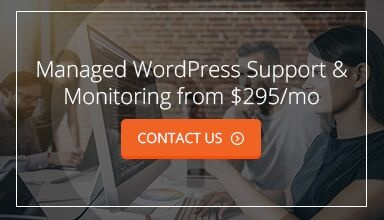 You can even take monitoring a step further. Today, with the advent of so many platforms taken off-the-shelf, monitoring a software package for vulnerabilities is also recommended. Many platforms such as WordPress, Drupal, Joomla, and Magento are popular targets for hackers. With proper monitoring, you can stay ahead of the updates and also, in the worst case scenario, act quickly if any intrusions were to occur. Ultimately, maintenance and Web server monitoring are necessary for security and keeping your website running smoothly. Selecting a third party to work with for maintenance ensures that your site will not go down and, in the rare event that it does, action will be taken immediately to get it up and running again.